I received a number of questions about the type of material to be used for the aquaponics pipes and liners. Obviously I can tell you what type of equipment I am using but I don’t know if it is the best for this purpose as I am not aware of any specific study on the topic. So for the pipes I use aquarium/pond pipes. They are made out of different materials such as vinyl and other plastics. They are not supposed to release elements into the water. PVC is also often used in aquaponics and I personally use some in my bell syphon’s design. The last point where we must be careful is in the use of glue. When you open a pot of glue you can clearly smell a strong chemical odour. Here I highly recommend to leave your glue dry for 24 hours before introducing it in contact with the water of the system. There are different types of silicon available and I generally try to stay away from them but when I really need to use it I get the one adapted for aquariums as it is supposed to release less substances into the water. Can we use plastic in aquaponics? This is what we’re going to see together in this video. So I received a few questions about what type of material can I use for my aquaponics system, and I already made a video about this, but there is a specific point and it is can we use plastic in aquaponics and especially for the pipes? You know the pipe is going from the water pump to the grow-bed, this is a very specific pipe that is often a type of plastic, plastic vinyl, whatever. You know, these are different types of plastics. So the question is what type of plastic should we use? Can we use them? And same question for the PVC. You know, if you have seen some NFT systems, Nutrient Film Technique, the food is often grown in PVC pipes. So are they good for aquaponics? That’s basically the question, the question that I received. And to be very, very honest with you, I am in a little bit in trouble when I receive those types of questions because yeah, I haven’t seen any real data about it. So I use plastics. I mean, I use pipes. I try to limit the quantity of plastic that I have in my aquaponics systems, but yes, I have pipes that are going from the water pump to the grow-bed. So for those types of pipes, I use some vinyl pipe which is this type of things. So this one is a really a clear vinyl tubing, and they say that it’s resistant to corrosion and abrasion. So it’s important to have some materials that are resistant and that are not going to break down with time. But what is also important is to make sure that they don’t release too many things in the water. So normally, those type of equipment, they are designed for aquariums or ponds. So we imagine that if they are designed for an aquarium, they don’t release anything that is toxic. Otherwise, it would maybe kill the fish. But what we don’t know is what is the limit? What is the quantity of element that they are releasing into the water? And at one point does it become dangerous for us because you know, sometimes you can accumulate some particles until a certain point. So I am completely unable to respond to this question. I am very honest in this video. But I’m going to ask you if you have any expertise in this field, nowadays the community stands out and people who are subscribed to this channel, which means that there are probably 10 times more people who are really watching my videos. So if you have any expertise with plastic especially in contact with water that we’re going to drink or where we’re going to grow some food, please leave a comment in the video and share your expertise because here we are all the same. We are all playing with tubes but we don’t know what the real impact is in the long-term. So obviously, a lot of people are using it around the world, and it’s working, right? For aquariums in aquaculture we use also a lot of pipes. We use PVC and it doesn’t really – I mean, we don’t see any real effects on the fish and on the consumer. But I haven’t seen any real serious study on those specific points. So what I’m going to give you today is not really what type of equipment you can use. Obviously, for me I use most of the time equipment that is designed for aquariums and ponds and PVC, I try to limit because I know that it’s not the best. But when I use PVC, I limit it. So here, for example, in my setup I designed my bell siphon, thanks to some PVC pipe. And if I design an NFT system, I’m going to use some PVC. Yes, that’s right. I’m going to use some PVC but I’m going to try to limit the area where they are exposed directly to the direct sunlight. So you know that the sunlight when it goes into the plastic and on a lot of materials, the UV they can affect the materials. Also the difference of temperature between cold temperature and high temperature when you got those difference, the material is going to dilate and contract. So that’s where you can have also some particles that are released into the water. So if you can, try to limit the area where the sun is completely directly – I mean, when you’re going to have a direct sun exposition. But also when you can, try to cover the pipes, if possible. It’s always possible but when you can, try to limit basically the quantity of PVC that is exposed to the sun. That’s really the best advice I can give you. Then in terms of glue because when you work with PVCs, most of the time you have to use some glue. So the glue that you’re going to use is not the best because I know if you have worked with PVC before but when you open the tube you can really smell a kind of very, very chemical odor. So you want to limit the quantity of glue that you use but obviously, you need to use glue, so when you used glue, just let it dry. Let it ventilate for 24 hours before putting the system in water or before adding the part into the system. You want to make sure basically that the glue is completely dry before adding the glue into the system. It’s going to avoid all the particles to be released in the water and basically your water to be toxic. The last point that I want to add is if you designed some specific systems especially if you have some tank with some glass and if you want to expose the fish so if you want basically to add glass in the system, you may want to use silicone, silicone or other type of equipment, material so in this case, what I recommend is to use silicone that is adapted for aquarium. So the aquarium products, obviously, they are designed to limit the quantity of toxic materials that are released in the water because obviously, you’re going to keep fish alive, or you can also use equipment that is designed for food grade if you find any, but for the silicone I know those ones that I use generally is the one that is adapted for aquarium. So it’s most of the time when I do indoor aquaponics systems when we want to see the fish in this case if I really have to use silicone, I limit the maximum because I know it’s probably not the best thing to use. But if I really have to use it, I will use silicone that is adapted to aquariums because once it’s dry, it’s not supposed to release anything in the water. So that’s the best advice I can give you, and I’m sorry I’m really not an expert of all those chemicals. I know that in aquaculture, we use them without any specific caution because you know, it’s diluted in the water even in recycled systems that are very close to aquaponics where we recycle the water a lot, but I know as well that if we can limit it, it’s better. And if you have any specific advice, if you are expert in plastic, please give your comment below the video and let me know even if you are not expert what type of plastic are you using. I’m sure a lot of you are using PVC vinyl such as the pipe I just showed before you know, the pipe that you put on your water pump. And also we use those pipes also connected to the air pump most of the time. So let me know what you are using. It’s very important and it’s quite a sensitive topic. I know that a lot of people are scared to work with plastic in aquaponics and I am the first one in this case that’s why I limit the quantity but please share. We need to talk about this topic like we don’t want to hide it. We want to just limit the quantity that we use and try. If there is one material that is the best, let’s be all aware of it and let’s use. So please put your comment here below the video. If you are new to the channel, you can subscribe because I release one video every week and in those videos, I try to share my best advice, my best tips, and even today, it’s one of those videos where I have a lack of knowledge about the specific toxicity of the plastics that are used in all our setups. So I’m not scared to tell you. I share. When I have some knowledge I share it, but when I don’t know something, I tell it as well. And in these videos, the aim is to really use the community to find the best option. So if you subscribe to the channel you’re going to receive one video every week, a good tip most of the time. I’m talking about the limits of aquaponics, how many fish can you keep, the ratio between the fish tank and the grow-bed, all those types of things that are very basic. 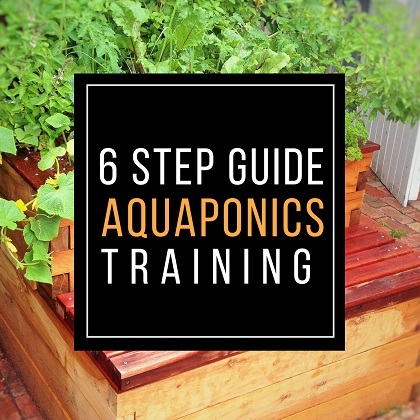 But if you don’t get them right you can be sure that you’re going to fail in aquaponics. So they are crucial information, and it’s completely free. You get it from the description of this video. You’re going to find a link or in the ‘i’ like information in the corner of the video somewhere. You click on it and it’s going to guide you to this free training where I really try to help you as much as I can. So I hope you enjoyed, once again, and see you in the next one. Bye-bye.